Steve Shingler is a promising fly-half who despite turning out for Wales at Under 20 level is in the frame for a place in the Scotland side for the forthcoming Six Nations. The 20-year-old joined London Irish from the Scarlets and Llanelli RFC where he had been a constant and consistent performer in the Welsh Premiership. An accurate goal kicker, who amassed 317 points during his time at Llanelli RFC, he made his competitive debut back in 2009 against Cross Keys and went on to play 44 games. During this time, he also appeared for the Welsh U20 side. Shingler played for the Scarlets on four occasions before making the switch to the Exiles in the summer of 2011. 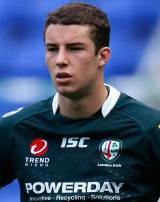 Upon arriving at the Madejski, Shingler made a host of appearances for London Irish which included a score against Worcester. He copped a four-week ban following a red card against the Cardiff Blues during their clash in November 2011. But he did enough to impress Andy Robinson and - turning his back on Wales - earned a call up to the Scotland side for the 2012 Six Nations.